The UK's super-rich have seen their wealth fall in the past year during the economic downturn, according to this year's Sunday Times Rich List. The top 1,000 richest people in the country now have £258bn between them, it estimates - down from last year's record of £413bn. Over the past 12 months the number of billionaires has fallen from 75 to 43. 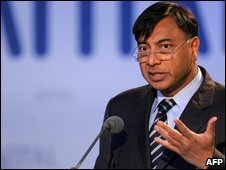 Indian steel tycoon Lakshmi Mittal, and family, are top again with £10.8bn, down a huge 61% from 2008. "Never in the 21-year history of the Rich List has the collective affluence of those who live and work in Britain fallen by so much," says BBC business correspondent Joe Lynam. "The super-rich may be better placed to weather the worst recession in 30 years, but if this list is accurate it shows that none are immune from it." Russian oligarch and Chelsea football club owner Roman Abramovich is at second place again, although his pot of cash has fallen by 40%, to £7bn from £11.7bn. Meanwhile across London, fellow Russian billionaire and Arsenal shareholder Alisher Usmanov has seen his fortune drop a massive 74% to £1.5bn. Completing the bad news for football-related businessmen is Newcastle United owner Mike Ashley, who saw his wealth fall by a half from last year, down from £1.4bn to £700m. Other well-known names have been hit, according to the list. Virgin boss Sir Richard Branson is reported to have lost 56% of his wealth, shedding £1.5bn and is now worth £1.2bn. Meanwhile, Formula 1 motor racing chief Bernie Ecclestone lost £934m, leaving him at £1.46bn, the list reported. The richest British-born billionaire is the land and property owning Duke of Westminster, who has seen his wealth shrink to £6.5bn from £7bn. In fourth spot are Ernesto and Kirsty Bertarelli: the former Miss UK winner and her husband have a £5.6bn fortune based on pharmaceuticals. Their fortune has shrunk by a relatively modest 12% over the year. But it is not all gloom - the former boss of supermarket chain Morrisons, Sir Ken Morrison, has seen his fortune increase by 11%, making him worth £1.6bn. The wealth of Peter and Denise Coates, owners of Stoke-based online sports betting website Bet365, has gone up by 33%, to £400m. And Harrods boss Mohammed al-Fayed has benefited from a cheap pound - his fortune stands at £650m, up 17% on last year.